Hi everyone! Are you ready to journey back to the world of fairy tales and magic? I was really looking forward to the season premier and I thought I would watch the special feature to remind myself of the twists and turns of last season. So if you weren't able to catch it, here's my recap of the recap. Innocent + persistent = smartest character + Mother = Savior - adoptive mother = trouble + Rumple + Neal = Grandfather!? + problems + other bad guys = kidnapped by ... Peter Pan? Great! So now that we're all caught up let's jump into Season 3! 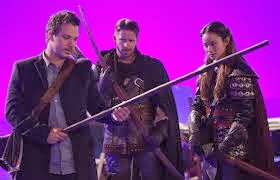 3.1 "Heart of the Truest Believer"
Tonight Henry runs into the woods with an ex-Lost Boy, tangles with some pixie dust, and proves himself to be a true believer. 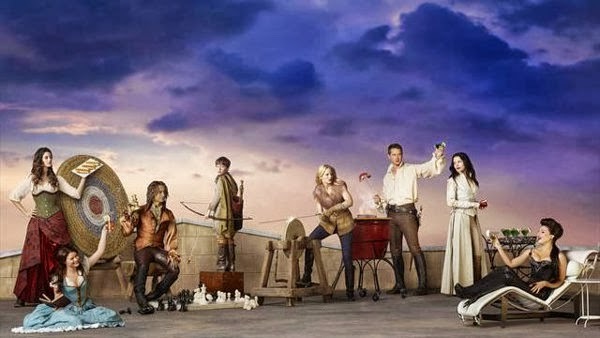 Meanwhile Snow, Charming, Hook, Regina, and Emma survive a mermaid attack, and whip up quite a storm ... literally until Emma is able to bring them all to their senses. Back in the Enchanted Forest Nealfire has a chat with Mulan, makes friends with Robin Hood, and finds a magic snowglobe. Tonight I think that, believe it or not, Mulan had the line that summed up the point nicely: She tells Nealfire, "Your belief in love wasn't strong enough to overcome your fear of rejection." And this becomes the sticking point for a lot of our characters. Can they believe in love enough to save themselves and each other? Or are they going to get caught up in how hard it is or could be. Tamara and Greg are, as Pan says at the end, driven by hate. They don't believe; they want to destroy and it gets them stabbed in the back - literally. They also teach us the important lesson that you should never, ever, ever tick off a Lost Boy. Because they are mad creepy. Also, you probably should stay away from Rumple's family. Because he doesn't really do forgiveness. Rumple may be driven by love for his family, but his motives are getting so convoluted that it's hard to know where he's going to go next. I really do hope that he believes in family enough to overcome his fear of losing his power, but it makes me nervous having him out on his own. For our three villains (Rumple, Regina, and Hook) Regina and Hook's conversation wraps up the difficulty they face. Regina notes that "Villains don't get happy endings" to which Hook responds, "I hope not, or else we've wasted our lives." So can the three of them make enough things right? Can they un-become villains? Or are they destined to suffer and/or die because of their past villainous ways. And can they break out of that villainy or are they trapped in it forever? And at the same time, Emma shouts at Snow that good doesn't always win, but she consistently makes the "good" choice, proving that Rumple has underestimated her ability to take a leap of faith, and, I think, the breadth of her imagination. After all, we are talking about a woman who went from being a pragmatic bounty hunter to believing that she is the savior of the fairy tale world whose mother is Snow White. I think her imagination's been stretched quite a bit recently and she's adapted remarkable well. Which is why she's not really surprised when mermaids attack the boat (btw, love that they are vicious monsters) and is the first to realize that the weather is being directed by the attitudes on the boat. Brilliant plan to get everyone's attention, but true to the nothing-can-ever-go-right-for-a-Charming-ever edict, a loose pulley knocks her out, but also knocks sense into the others on the boat who have to pull together to save her. Though Regina's attack on Snow's use of "unicorn stickers" to win over the mermaid was hilarious and the ensuing cat fight bordered on ridiculous. In a good way. Charming: "I will not be capsized by fish!" This was my lol moment of the night. Back in the Enchanted Forest we get to see our intrepid trio of Aurora, Philip, and Mulan. Mulan as a foil for Nealfire is pretty hilarious and I love the way he tells her the movie is pretty good. Too bad the character on the show in no way matches up with that movie and that she can't get a decent story line of her own. And I'm kind of nervous about some of the hints and nudges they've been building around her because if they go where it seems like they're going to go I may just have to throw a shoe at the screen. However, Aurora is epic and I love the way she's just taking charge. Philip was kind of walking set piece in this episode. 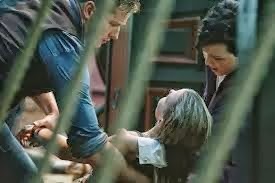 I love the fact that Belle's insistence on mercy for Robin Hood came back to save Nealfire's life (rabbit trail - do you realize that in time Belle could end up being Henry's step-grandmother?!?! ahem.) and I was happy to see Robin back in the picture. I'm truly curious how they're going to play this because I don't think I can handle a long drawn out we-have-to-get-back-together story line. Again. I was actually kind of hoping that the magic eight ball snowglobe was going to transport him right there, but that would have been too easy. And of course, as our episode title directs, Henry does have the heart of the truest believer. This kid will hold fast to his beliefs in the middle of anything, and that fervency is really the only thing that has kept him alive. It's also gotten him in a heap of trouble, but you know. It's a good thing he's had so much experience running through the woods, because he gets out of there awfully quickly when Tamara yells at him to run. His utmost faith in his family, in his own ability to survive, and in the magic that surrounds him is touching. It is such a hard line to walk and he could come across as obnoxiously optimistic, but the actor hits just the right tone and you just root for Henry to keep believing. I totally didn't call Peter Pan, but then was hitting myself over the head thinking - duh, of course that was him. But he seriously underestimates Henry. A kid who is willing to go to such extremes (I mean, jumping off a cliff?!) is not going to just give up or give in without a fight and Peter Pan has no idea what lengths Henry's family will go to in order to rescue him. Labels: Fairy Interesting, Fairy Tales, Once Upon a Time, Rebecca T.
Hooray! Rebecca's reviews are back! My favorite line of the night was Hook's to Rumple/Gold, "That's a good use of our time, a wardrobe change." I felt the scenes with Aurora/Phillip/Mulan/Nealfire were very short and rushed a bit. And I agree, I like how "take charge" Aurora was. You can tell the character has grown a lot since she was first introduced last season. And I think there was a bit of an homage to TNT's now cancelled show "Leverage" towards the end, as Emma lists off everyone's "title" (a villain, a pirate, etc.). Leverage's tag was "Hitter, Hacker, Grifter, Thief, Mastermind" (or close to that order). I definitely have to watch it again because it was action-packed and really, really very good!